← Are you feeling Green, or Yellow, or Blue? 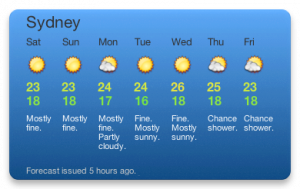 If you are using a Mac, there is a nice Dashboard Widget that displays the next 7 days weather forecast in Australia, Weather Australia. Drawing its data from the Bureau of Meteorology (BoM). 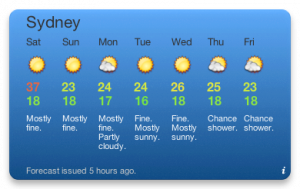 Much better than the widget that comes with the OS for Australian information. There are the occasional hicups though. Looking at today”s temperatures on the MacBook I can see that it was a scorcher. A day you would melt in at 18-37. Though I don’t seem to remember the day being that hot. Where as, on the other side of the the room, the G4 thinks it was a nice 18-23. A day to stroll about and not be too worried. This seems more like what I remember of the day. They are both on the same network. So should be pulling the same data. And displaying the same results. Perhaps the MacBook just exists in its own continuum. Or it is thinking back to the day just passed where the temperature soared to 37 degrees and above?